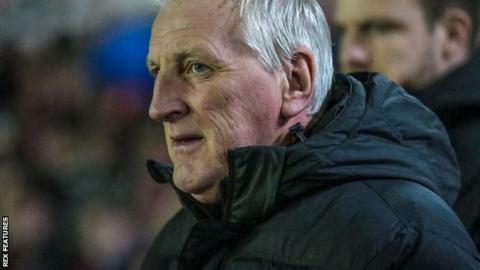 Hartlepool United manager Ronnie Moore says his new young signings need to make more of an impact. Pools lost 3-1 against Accrington on Tuesday night, and Moore was not happy with the performances of Nathan Thomas and Ellis Harrison. "You are going to get your ups and downs with the young ones," 62-year-old Moore told BBC Tees. "They've come to us to get games, but if they don't give us what we're looking for, then they don't play." Winger Thomas joined Pools from Mansfield Town, while Harrison, also 21, arrived on a one-month loan from Bristol Rovers. Hartlepool, who have not won away from home since October, are 21st in League Two and six points clear of the relegation zone, but Moore wants his side to start matches more positively. "You can't start as slow as we started in this game," Moore added. "The frustrating thing for me is how many times I've told players to show them down the line and they don't do it."